I really loved this recipe! My only beef with it is that you can’t really taste the cauliflower because the Brussels sprouts really over power the dish. If you don’t like sprouts you will NOT like this recipe. I happen to love sprouts, but even when we were finishing up the left overs a few days later I thought the sprouts were a little stronger than I like. The bacon takes the cake in this recipe and just makes it into something really special. I think you could do so much with the concept of this recipe by changing out the vegetables. I think potatoes and carrots would rock in this sauce! Place cauliflower and brussels sprouts in a large saucepan and cover with water. Bring to a boil. Cover and cook for 2-3 minutes or until crisp-tender; drain. Meanwhile, in a large skillet, cook bacon over medium heat until crisp. Remove to paper towels with a slotted spoon; drain, reserving drippings. Sauté onion and garlic in drippings until tender. Stir in flour until blended; gradually add the milk, cream, salt and pepper. Bring to a boil; cook and stir for 2 minutes or until thickened. 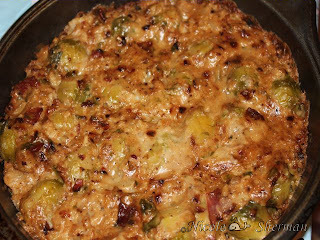 Stir in cauliflower mixture and bacon. Transfer to a greased 2-1/2-qt. baking dish. Cover and bake at 375° for 15 minutes. Uncover and bake, uncovered, for 15-20 minutes. Yield: 8 servings.